Tonight’s TGIT includes Grey’s Anatomy 15×12, and How To Get Away With Murder 5×12. Here’s our thoughts on what happened! The holidays arrive in Seattle and with it comes happiness and pain. The whole episode centers around the coma patient Natasha, and her fiancé Garrett. As she initially wakes up and gets better, but then suddenly gets sick and everything goes downhill from there. Her story also affects those around her as the doctor’s relationships are tested too. Owen and Teddy are still learning how to deal with their situation, as the holidays bring the realization that they’ll have to learn how to make their own traditions with their baby. They also learn that they’re going to be having a little girl together, which makes them emotional. Things at home are going less well as Amelia and Owen learn that Betty has been lying to them. Not only has she not given them her real name, but she also tells them that her real parents have no idea where she is or that she had Leo. Upset about Betty’s lies, Owen freaks out later. He makes a rude comment about Betty using her addiction as an excuse to use them and of course it upsets Amelia. It causes Amelia to leave for the night, and though they make up the next day it just shows how rocky these two still are. Everything with Ben and Bailey is still super awkward too. He drops of Christmas presents for Tuck only to discover that Bailey already put his name of things she bought. The next time they see each other at the hospital Bailey also tells Ben that she misses him and she wants him to come home. But she doesn’t really do it in the best way and he has to leave because of a call. Despite still being heartbroken about what she did, Ben surprises Bailey with the tree house he promised to build her. He confronts her about leaving him instead of sticking together, but he also apologizes for not being there for her more. Meanwhile Meredith is still dancing around DeLuca and Link. DeLuca asks Meredith out on Christmas Eve but she has to go home to her kids so she invites him over to Alex’s on years instead. When the night arrives though, she stays at the hospital to be with Natasha. So both DeLuca and Link feel like they’ve been stood up. Not surprisingly, DeLuca gets upset that Meredith stood up him up and didn’t even call or text. He’s adamant that he doesn’t want to play games with her. 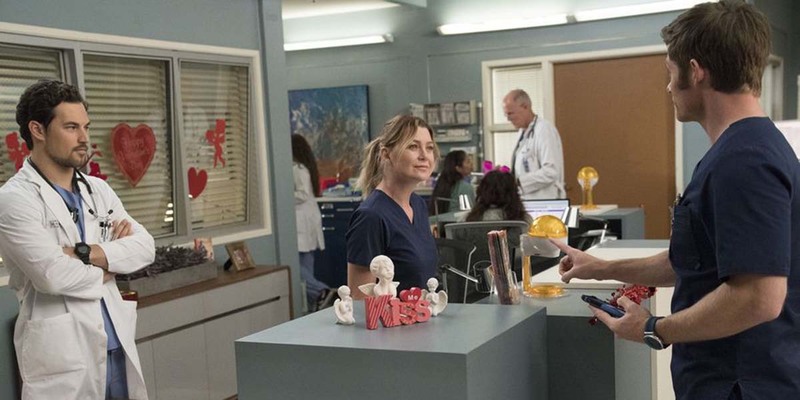 The next time they talk, DeLuca accuses Meredith of continuing to make up excuses. So she ends up asking out Link instead. Which surprises all of them and definitely upsets DeLuca. or because she’s just getting worse. So all the doctors get together to throw the couple a wedding. Their beautiful vows have an effect on all the doctors, even Meredith and DeLuca. DeLuca ends up bringing Meredith to the rooftop to have their date finally. They toast to the couple and thankfully have the kiss that everyone has been waiting for! While the episode was quite emotional, it provided a ton of development for many of the characters. There’s really nothing to complain about. And I’m more than ready to see what’s going to happen between Meredith and DeLuca for the rest of the season. I thought I felt bad for Bonnie in the last episode of How to Get Away With Murder, but now that I’ve seen her pow wow with Miller’s mom and checking out baby pictures of her late BF, everything we’ve seen before is like child’s play. Is it just me or is Bonnie taking one for the team more than anyone has before in How to Get Away With Murder? I guess the only thing that makes her actions reasonable is that she’s technically defending herself. If it had been anyone else who stole Miller’s last breaths she would deserve a medal for martyrdom. Bonnie isn’t the only woman suffering for the sins of the group, and the other one isn’t nearly as guilty. I couldn’t believe that Michaela was willing to hurt Tegan to help their cause. Hopefully it didn’t kill any chance of the two of them regaining their relationship in the future. I’m really into Frank’s character in How to Get Away With Murder season 5. He’s been there for Nate in unexpected ways, and I feel like the Frank and Bonnie relationship is really hitting its stride. They began the series with a weird sense of competition and jealousy, progressed to an ill-fated romantic relationship, and seem to have finally achieved the level of friendship that they’ve always been capable of. At this point, they truly need each other, and it’s great to see them realize that. 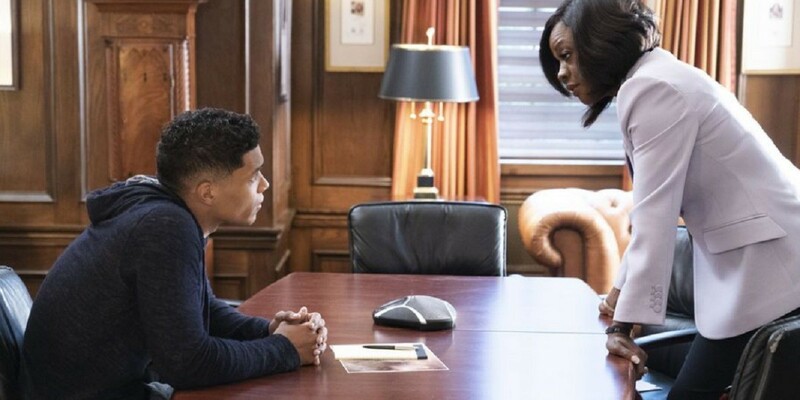 Another character I felt bad for in the last episode was Gabriel, and that situation also got worse in How to Get Away With Murder season 5, episode 12. Not only has he been arrested for something that he had nothing to do with, but he also found out that everyone he knows has been spying on him. He’s done some shady stuff, but it was all in the name of finding out about his father. Other than that, he actually seems like a really nice guy. I can understand why Annalise got upset that the evidence Frank, Bonnie and Nate presented would link her to “Sam’s killer,” but I would have thought that if there was one person she’d put herself in the line of fire for, it would be Nate. This guy has been put through hell for her, and finally found something worth growing a backbone for. I don’t necessarily blame her for getting upset, but in my mind, she does kind of owe Nate for everything she’s put him through. Luckily, she agreed in the end, and decided to tell Gabriel anyway. Being Annalise, she was able to use it as fuel to get Gabriel on her side. It doesn’t look like the FBI is buying his story right now, but Annalise has spun crazier stories to win a case, so I’m not counting this one out yet. She’s going to need to pull out all the stops now that they’ve found Miller’s body and Asher’s parking lot proclivities have shone the insta-spotlight on Nate. Everything’s stacked against the Keating 5+, but there are still a few episodes left of season 5 for Annalise to turn things around. Side note, apparently the entire staff of Caplan & Gold is in love with Annalise? I know who I’m rooting for. How about you?